They’d be in trouble because the hot topic on the internet these days is FAT SQUIRRELS. Folks, they need to store up for a long, lean time…let them get chubby! And everyone's got something to say about it! But it’s not just the chubby ones who have a problem! Posted in squirrels. Tags: gray squirrels, human animal interactions, obesity, power outages, red squirrels, roadkill, squirrel hunting, Twiggy the waterskiing squirrel, wildlife rescue on January 13, 2016 by Mikel Delgado. Squirrel related power-outages were reported in Verona, WI, Eagle Mountain, UT (where the squirrel was “roasted”), Windsor, Ontario (where the squirrel survived! ), and Edmond, OK.
Regina, Canada, is taking action to protect squirrels from electrocution, installing “squirrel savers” to transformers, and consequently preventing future power outages. Turns out in West Liberty, IA, costs of power outage due to squirrel are running up towards half a million dollars, and with an insurance company refusing to pay, the city has to fork out another $5K for a consultant to research the claim. And last year in Bryan and College Station, TX, squirrels caused over 300 power outages, leaving rodents responsible for around 30% of all power outages in the area. To add to the mix, a squirrel started a brush fire in Camas, WA. Posted in squirrels. Tags: alarm calls, animal communication, Bornean tufted ground squirrel, eastern fox squirrel, football, power outages, roadkill, squirrel cook-off, squirrel hunting, Squirrels Unlimited, tennis, urban wildlife, western gray squirrel, wildlife rescue on September 8, 2015 by Mikel Delgado. 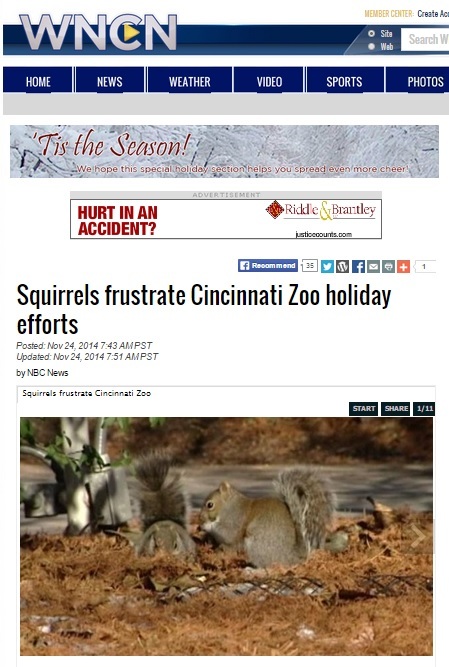 All the squirrel news that's "fit to print" - squirrels got busy in November! Squirrels love the holiday season! Every year, the Cincinatti Zoo has a “Festival of Lights” – with millions of beautiful lights for their holiday festival. The squirrels historically chewed the wires and removed light bulbs – burying them as if they were nuts – leaving the zoo to switch to LED and not hang the lights until the very last minute. The video is pretty awesome. Squirrel damage seems to be a theme in the news these days, with this article: “Squirrels are cute until they cause property damage” which outlines the many ways squirrels can damage your attic, trees, and bird feeders. Posted in squirrels. Tags: Arctic ground squirrels, caching, Cincinnati zoo, circadian rhythms, crime logs, Festival of Lights, grey squirrels, Jennifer Lawrence, power outages, predation, property damage, punks, red squirrels, squelfie, squirrel hunting, steroids on December 1, 2014 by Mikel Delgado. Police in Carboro, NC were concerned when there were reports of drive-by squirrel hunting within city limits. The hunters couldn't be bothered to get out of their car to take a shot at the rodents, and hunting in the city is illegal. A man in Milford, CT who shot a squirrel in his yard was charged with unlawful discharge of a firearm. An unregistered assault rifle was seized (although that's not what he shot the squirrel with), as well as several large-capacity magazines. 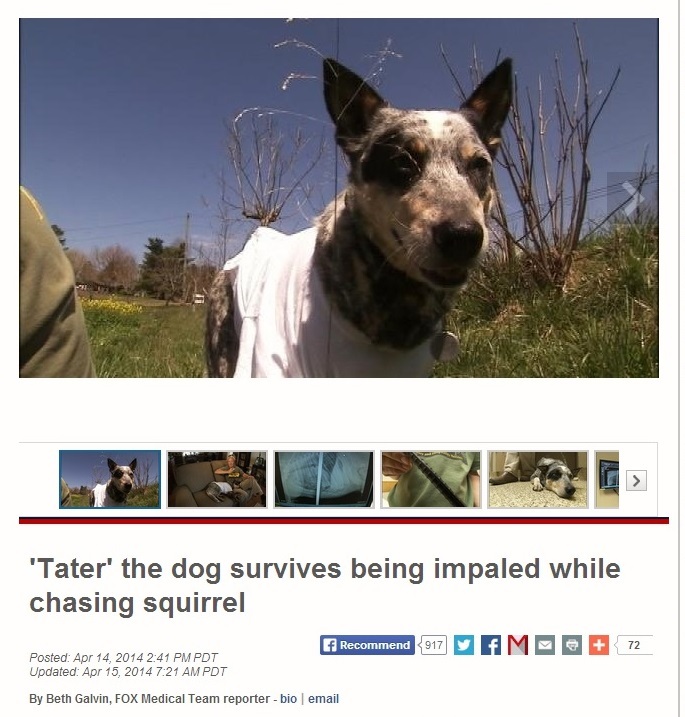 A dog was impaled on a post after he got distracted and chased a squirrel. Luckily he's okay! A woman flipped her car to avoid hitting a squirrel. The car hit a telephone pole, but the driver only suffered minor injuries. Posted in squirrels. Tags: baseball, bird feeder, gray squirrels, malcolm campbell, red squirrels, sports mascots, squirrel hunting, squirrel mortality, squirrels, wildlife rescue on April 21, 2014 by Mikel Delgado.